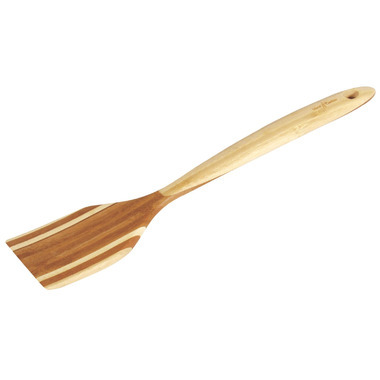 This Island Bamboo Large Spatula is an earth friendly choice for your kitchen. Island Bamboo products are an earth friendly choice for kitchenware products because they are high quality with a long useful life, manufactured from bamboo, a renewable resource and thoughtfully packaged to reduce waste. The Island Bambooٙ brand is manufactured exclusively from Moso bamboo, while the HUE Bamboo line extension incorporates innovative material accents including non-toxic silicone, food safe lacquer and rainbow wood made from white birch. Bamboo is a renewable resource and viable alternative to wood and petroleum based products. It is a plant that grows abundantly, as much as 2 feet per day, with little water while providing 35% more oxygen than similar standings of timber. Additionally, Island Bamboo uses Moso bamboo, which is not a food source for Chinaْs endangered Giant Panda. Happy with this product! I bought it since my plastic Kitchen Aid spatula melted on my pan with a light stir, so the wooden spatula works much better!